Very light and variable winds at Guildford Model Yacht Club’s Abbey Meads lake provided challenging conditions for 15 Footy enthusiasts, who had travelled from as far away as Bristol and Kettering to enjoy 14 slow, but nevertheless tense races. All the boats were measured by placing them in the measuring box, the widest boats fitting axially and the narrowest diagonally and this took only seconds. All sail plans fitted within the 2011 Experimental Footy rig template, which limits the sail area to about 300 square inches and ensures that there are no rig wars, with everyone using similar sized sails and just sailing skill determining performance. A lot of patience and concentration was required to coax these little boats around the 150 metre long course. The Footy with its lightweight and big sail area was probably the class that could make the best of the conditions and there was speed at times, which left distinct wakes on the mirror finish of the water. Concentration on wind indicators and observation of the pattern of the faintest gusts was essential to maintaining forward progress. Racing started with the wind in the WSW direction and the 2009 champion, Rob Vice sailing the original ICE, started with a win, from Peter Jackson and Rob’s son CJ, both sailing ICEs. Peter underlined his challenge by winning Race 2, changing places with Rob, who won the next 2 races from Hugh McAdoo and David Wilkinson respectively. As Scott Wallis had terminal technical difficulties with his American Hagerup RANGER design, he borrowed a SUPABUG and won Race 5 from Rob and Peter. This was the longest race of the event so far taking 16 minutes for the first boat to finish. In Race 6 the positions were reversed with Rob taking the win. He went on to take Race 7 as well, beating Peter and Alan Viney to give him a total lunchtime score of just 7 points, ahead of Peter with 15 and Hugh with 22 points. Immediately after lunch a special Medal Race was organised for the juniors. Hayley won the start of this match race, but by the windward mark CJ had overtaken her and went on to win to the applause of all the spectators. They were both delighted to win Gold and Silver medals presented by Guildford’s commodore Hugh McAdoo. The wind became even more variable, blowing from NW, SW and Easterly directions and very light indeed. Peter kept up his challenge by winning Race 8 with Rob second and Gary Sanderson sailing his own DUCK design, with a tall narrow balanced una rig in third place. The wind dropped exceedingly light for Race 9, virtually a flat calm. Scott, who had been given a servo to replace the failed gear in his RANGER at lunch time, started well seeking out the puffs with his very light boat and developed a huge lead in the reaching conditions. However such was the patchiness of the wind that it allowed the fleet of ICEs to close the gap. Somehow right from the back of the fleet, Rob managed to sail his ICE past everyone and Scott to win the race, which took 22 minutes. The wind picked up a bit in Race 10 and Rob was again the winner, from Alan Viney and Peter Shepherd sailing a brand-new ICE in third place. Hugh who had been struggling in the lighter conditions won Race 11 from Rob and Scott. Race 12 was the longest race of the day lasting 23 minutes and once again it was Rob’s skill that brought him home first in front of Wicksteed team of Peter Jackson and Peter Shepherd. In the slightly stronger winds of 1 or 2 mph Hugh McAdoo showed his usual form to win the last 2 races from Rob. However it was Rob’s consistency that took him to the top of the leaderboard, with a fine win with just 16 points, half the points of his closest rival! 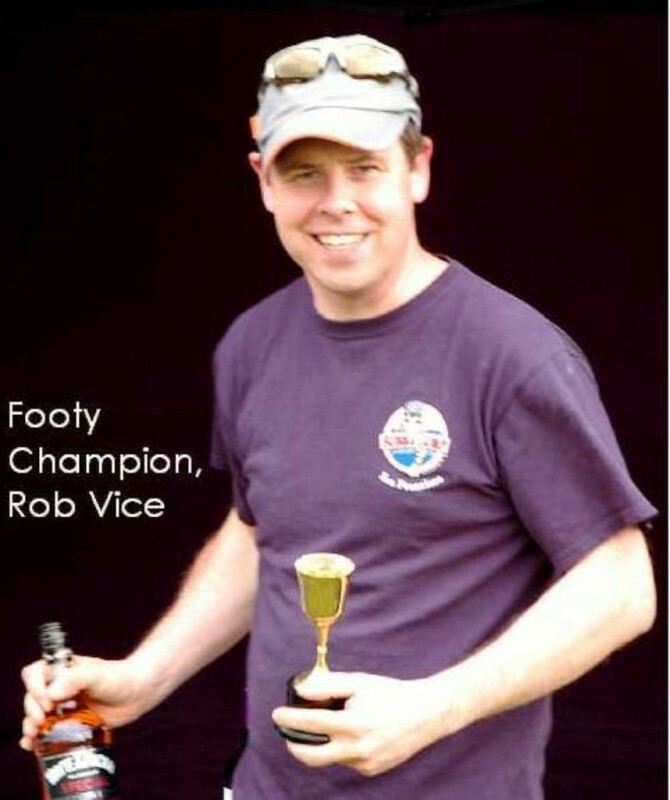 Rob thanked the Race Officer and the Guildford race team and supporters for their efforts in preparing the venue etc and putting on another good Footy event despite the very testing wind conditions. As well as success for Rob, this event was a triumph for the Wicksteed team of the two Peters, who have moulded their own boats from Roger Stollery’s ICE moulds and are getting some good results against their rivals from Guildford. As well as building boats and improving his sailing performance, Peter Shepherd has created a new UK Footy website, sailfootyuk.com helping to generate even more enthusiasm for these fantastic starter boats. 15th Hayley Vice Guildford ICE 161.